Free Movie: Ferris Bueller’s Day off. Monthly event. The Pro Watercross race series showcases the finest seasoned professional and amateur athletes. I have some market news to share with you. Continued strong demand and low inventory of affordable homes is producing a challenging market for buyers in many neighborhoods. Let’s take a look at the details. There were 733 homes available for purchase at the end of May. This was a 2.5% increase when compared to April, but down over 33% compared to this time last year when there were 1,102 homes available. Next, we will look at the number of units sold. Reno/Sparks area REALTORS sold 543 single family homes in May, which was an increase of 10.6% compared to April. Despite the increase over the last month, there was a 20% decrease in the number of homes sold compared to May 2017. Inventory is down by over 33% year-over-year. With fewer listings and continued growth in the region, the economics of supply and demand are impacting the median price and days on market. 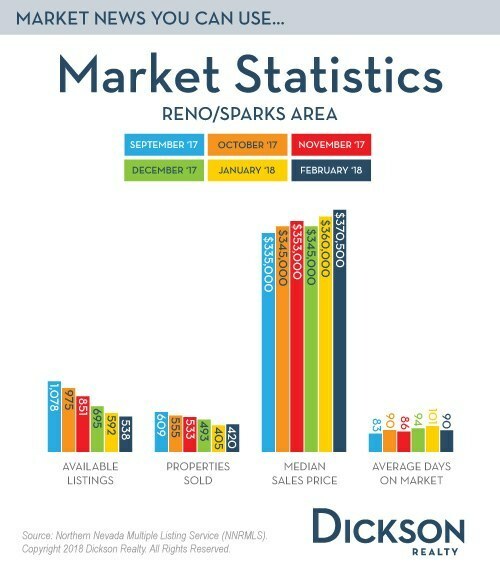 The median sold price for single family homes in Reno/Sparks decreased by $1,000 to $373,000 in May. Year-over-year, this number increased 11.3% from $335,000 in May 2017. Median means “in the middle”, so half of homes sold above the median price, and half sold below. Average Days on Market for homes sold decreased from 78 days in April to 73 days in May. At this time last year, Days on Market was 21% higher, at 92 days. Even with the bustling market we have experienced for the past several years, it is more normal for Average Days on Market to be closer to 100 days this time of year. Why should this information matter to you? If you want to purchase a home in today’s fast-moving real estate market, I recommend that you work closely with me and your lender to get pre-qualified before looking at homes. If you’re a seller, demand is strong, and there is little competition in many neighborhoods and price ranges. Whether you are considering a move up, across town or to downsize, now is the best time for us to speak about your options. An eclectic feast of home brews and bites with festivals that benefit good causes. The only officially sanctioned bull riding tour of the Professional Rodeo Cowboys Association comes to Reno!